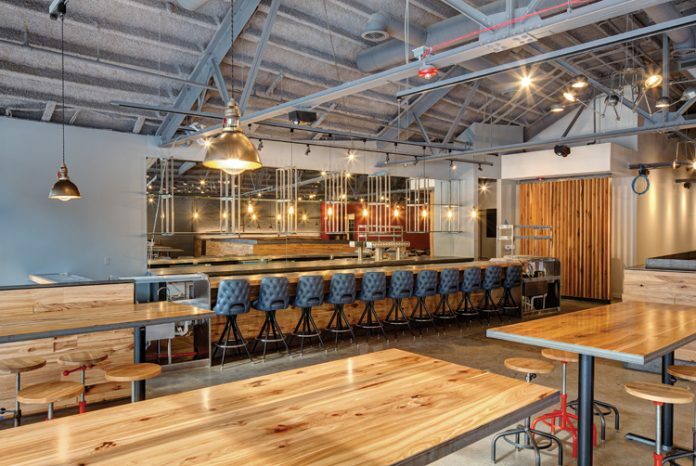 How a new restaurant and nightclub in downtown Royal Oak exceeded its budget, overcame unforeseen municipal requests, and still opened in just 10 months. 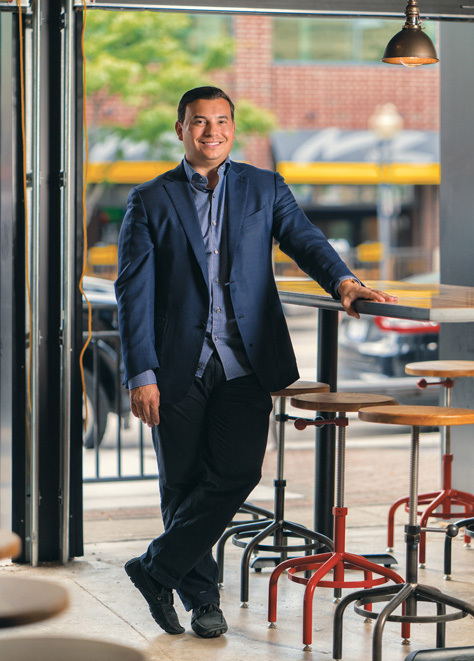 Four years ago, when metro Detroit was still recovering from the global financial crisis, Aaron F. Belen envisioned owning a fine dining restaurant in Royal Oak. Trouble was, the downtown district lacked a large office market to propel sales during the lunch hour, let alone after work. What’s more, the enclave was best known as a popular draw for comfort food, saloons, and nightclubs. Still, with Royal Oak’s central business district located near the convergence of two major freeways, I-75 and I-696, along with the district’s close proximity to Woodward Avenue, Belen started talking to friends, associates, and potential investors about acquiring the former Sangria restaurant at Fourth and Lafayette, and converting it into a high-end restaurant. His plan was to close the Spanish eatery and a nightclub above it, strip the structure nearly to its studs, and invest hundreds of thousands of dollars in what Belen hoped would be reviewed as a five-star restaurant and an upscale club. “Every single person I spoke to in 2012 said this (idea) was insane, it was way above market, and the city of Royal Oak (couldn’t) support the concepts (I was) bringing to the market,” says Belen, president and CEO of AFB Investments and AFB Hospitality Group, both in Berkley. He bought the building anyway, believing there was inherent value to a location next to two of the city’s more substantial office structures. The investment became Bistro 82 — a French-inspired, modern European bistro overseen by executive chef Derik Watson, who joined the organization in February 2013 with a resume that included having cooked for the late Princess Diana. Since its opening in 2014, the success of Bistro 82 — along with its sister business, Sabrage, a well-appointed nightclub on the second floor — has coincided with the ascension of downtown Royal Oak as a dining destination. Over the past two years, the restaurant has garnered positive reviews from national and local critics and media outlets, including Thrillist, USA Today, Fox News, and The American Genius. “We have people who will drive 45 minutes to eat Derik’s food,” Belen says. Having succeeded at an investment that some people said was crazy, what was Belen’s next move? It certainly wasn’t going to be basking in the satisfaction of having proved his skeptics wrong. He had another goal: He wanted his budding enterprise to be recognized as one of the region’s top players in the hospitality, food, and beverage business. Belen quickly realized that to get there, additional investment would be required. “The only way I could do it was to double down,” Belen says. That effort led him to an underperforming wine and general store in downtown Royal Oak on Main Street, between Fifth and Sixth streets. The previous owner’s vision for the property, located adjacent to St. Paul Lutheran Church, never quite seemed to match its potential — nor was the owner responsive to what the local market seemed to need. Belen saw greater possibilities. He didn’t just see a restaurant. He saw a concert venue. He saw a large dance floor. He saw a bustle of activity that connected to the outdoors on warm summer nights, with sliding glass walls that could transform the space in the course of an evening from a unique dining experience to a popular entertainment venue. The steps that followed demonstrate the challenge of taking a development project from concept through to reality — especially one that flies against convention. Enter The Morrie, named after Belen’s late grandfather. Starting a year ago, DBusiness chronicled the steps, twists, and turns of the building’s renovation and ultimate completion. This is how that experience unfolded. AFB Hospitality Group was the first company Belen would solely own. His previous work with partners had taught him a great deal — “some bad stuff, some good stuff” — but, at this point in his career, he was ready to steer his own ship. He wanted to build a company around his two downtown Royal Oak enterprises, Bistro 82 and Sabrage. Belen, above, says he signed the band Your Generation, also known as 50 Amp Fuse, to perform once a month at The Morrie. Other live acts will be scheduled regularly. At the start, Belen hosted weekly planning sessions at Bistro 82 with executive chef Watson; Scott Sadoff, director of operations; and publicist Rachel Lachover. Soon after, Belen hired architect Kevin Biddison, principal of Biddison Architecture and Design in Birmingham, to handle the design. The team began to interview general contractors in preparation for demolition. The goal was to open The Morrie in June 2016. Weeks later, the team selected Ronnisch Construction Group in Birmingham, and the goal was to have demolition permits in place by the end of January. Then, another issue arose. The city determined a water line entering the building wasn’t large enough to accommodate the projected demand, and requested that it be replaced. Even with the delay, Belen was confident AFB Hospitality could begin training employees in May and host a soft opening in early June. An unexpected request from the city to add a “family restroom” and several other previously unplanned amenities made the timeline and budget more challenging. Despite the unforeseen additions, construction barricades were erected in March. Soon after, the street and sidewalk were torn up to accommodate the new water line, while demolition commenced on the interior. 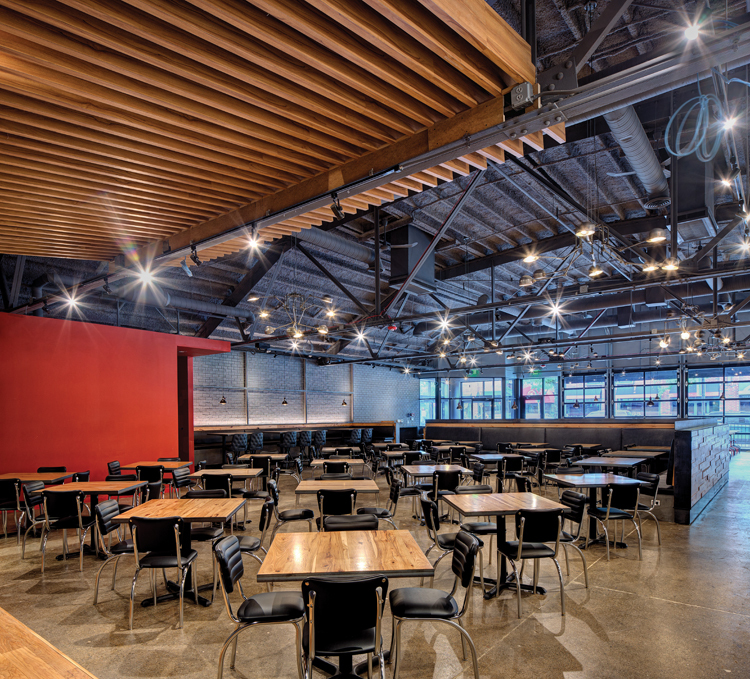 To those great bones, the construction team attached materials and components it expects will “tune into the roughness of the rock ’n’ roll.” The lighting elements were designed with an industrial feel, strangely achieved by the installation of chandeliers from Ireland. By mid-April, the interior of the building was taking shape. A solid wall was used as the backdrop for a stage that will host live bands after 10 p.m. Behind it, the skeleton of a robust kitchen was coming together, and Biddison began to plan the seating layout. “Every seat in the house will be able to see what’s going on in the front,” he maintains. To glean ideas for the layout, amenities, and décor, Biddison and his team visited close to 20 venues in Chicago that combine live music with a dining room and a dance floor. “Bar food and rock ’n’ roll doesn’t necessarily make you feel you’re going to get good service,” Biddison acknowledges. Even so, Belen was determined that The Morrie should combine the two — not only for the customers but for the bands, as well, which is why he footed the bill for a green room upstairs that includes a full kitchen. “You’re not going to get the caliber of talent we want to attract here without a great green room,” Belen says, citing his conversations with booking professionals in the music industry. In early May, Belen was brimming with energy as he assessed the progress. The drywall was up, the finish on the dining room floor was fresh and shiny, and the kitchen equipment was largely installed. Stage lighting and dining-area lighting were in place, as well. 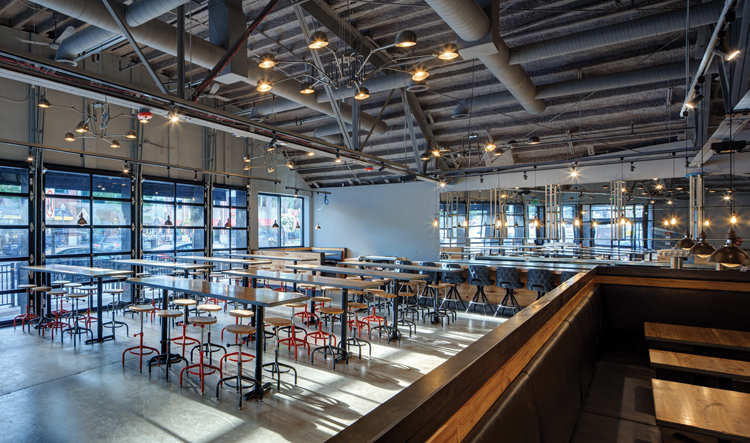 During construction, AFB Hospitality and Ronnisch realized the heating, ventilation, and air conditioning system (HVAC) would need a boost to better handle extreme weather days and hot, humid evenings. At the same time, there was concern that vibrations from the bands on stage would affect both employees and equipment in the kitchen. A previously unplanned extra layer of sound-absorbent drywall between the two was the agreed-upon solution. Sadoff says the team also decided to install electrical outlets in the seating banquettes to facilitate people who want to work on laptops or charge their cell phones while they eat. Advised that some people seemingly might never leave, the team shrugs and recognizes the occasional price of being customer-friendly. As the building nears completion, Belen reflects on the fact that he ended up using 12 more tons of steel than he had originally calculated he would need. He’s also not sure when anticipated profits will put him in the black vis-à-vis his investment in the building. At the same time, he says he didn’t want to cause added delays by obsessing over every last detail. Walking outside of the building along Main Street, Belen says he thought of everything from the angle of the sign toward passing traffic to the decision to make The Morrie’s private parking lot valet-only. That’s as much about controlling the traffic flow as anything else, but it’s one of those details that can’t be overlooked. Meanwhile, the final details are proving to be challenging. Royal Oak officials aren’t fans of exposed dumpsters — not even in alleys — so Belen decided to build a three-sided block wall that hides the large receptacle from most angles. In early June, the health department extended preliminary approval, which meant AFB Hospitality could begin the final installation of the kitchen equipment. It also gave the green light for preparing food for the purpose of training employees. Although that sounds good, it doesn’t equate to final health department sign-off, nor does it guarantee it. Happy with that choice, the biggest challenge that lies ahead is the only one that really counts — proving that all of the effort was worth it, and that the vision for the venue really works. Belen says the last step is entirely up to the market — and he believes it will embrace what The Morrie offers.